Learn how it can benefit you and your organisation. In essence Neuro-marketing is where the worlds of marketing and Neuro-science meet. The aim is simple – to generate more sales & revenue. For NPOs the aim is greater awareness of their cause. Marketing is what precedes sales and creates the opportunity for value to be exchanged. Marketers want their prospective customers to become aware and interested in products or service offerings. But marketing doesn’t stop when a lead was generated; it touches all other aspects of the business. Why? Because in essence, it communicates what you stand for and what you offer…irrespective of whether the communication is “broadcasted” by the Sales Director, receptionist or even toilet cleaner. All of this is done with our brains, right!? 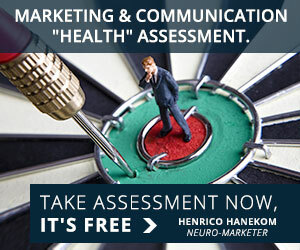 *Therefore no marketing can be approached without taking Neuro-science into consideration! *We live in an era where the advert has died. RIP! People have become blind to advertising. Neuro-marketing is the alternative. Taking this into account when planning marketing campaigns help us determine what to focus on. We want to influence the subconscious rather than the conscious brain. The effects—benefits—of Neuro-marketing can be seen all over the world. I recently saw a brochure for a company that hires out large cranes as a B2B (business to business) service. Instead of their marketing message being the obvious “We hire out the largest cranes”, they pitched it as “The biggest thing we move is time.” Brilliant! They were able to put themselves in their ideal client’s shoes and look at the need from that perspective. They understand that what their clients are actually buying from them is time saving when moving big equipment or material on a mine site. I consulted with an NPO whose mandate is to promote best practices in auditing. The challenge was that the information they wanted to convey was complex and technical. They needed to find a way to stand out from the rest and create awareness with a memorable message. After some guidance and Neuro-marketing mentorship they arrived at a visual story telling solution. This has gone viral and made an impact around the globe with a message that is remembered. This campaign has also branded the organisation as a thought leader in its field. Even though no new research is required to effectively employ Neuro-marketing, some companies take it even further. They study neural responses to specific Neuro-marketing research before launching campaigns. This makes sense for B2C (business to consumer) companies. One of them made indirect connections between cars’ headlights and human faces in advertisements. People’s subconscious minds are wired to react to other humans’ faces. This smart approach made the campaign more impactful. For this same reason of people identifying with others’ faces, one of my clients that own an exclusive match-making website used this principle. It was focused on creating trust and rapport with the right kind of customers. When marketing goes wrong it can often attract the wrong kind of customer that leaves a client with the kind of growth that debilitates a business. The solution in this case was a very simple, yet authentic, video used on the website that made all the difference to attract more of the right customers. A Visa facilitation service used our marketing tools on the foundation Neuro-marketing principles with spectacular success. This company doubled their revenue within 8 months. *The results show that Neuro-marketing principles are applied towards meaningful growth. Based on the traditional ways of marketing and advertising, some unique companies tend to feel that their products or services aren’t marketable. In comparison, the great thing about Neuro-marketing is that the approach is very flexible and fluid. This is important because truth be told: THERE IS NO ONE SIZE FITS ALL MARKETING! Based on various guiding questions such as these mentioned above, it will now make sense to you why every Neuro-marketing campaign is highly customised with a unique approach. Generate more revenue (especially of the right kind of business from ideal clients). For organisations who want to grow their sales and influence their target audience, the right tool to utilise may be Neuro-marketing.